Home » Academics » Schools » College of Arts, Humanities and Social Sciences » Faculty » John M. Rankin, D.M.A. John M. Rankin, D.M.A., has been a music teacher, music producer and composer, and professional trumpet artist for more than years. At St. Mary’s, he conducts instrumental ensembles, teaches Improvisation/ Jazz Studies, Trumpet, Fine Arts, Music Production, and also directs the Fiesta Jazz Festival. A native Texan, Rankin began serious trumpet studies in 1964 with Legh Burns at the University of Oklahoma in Norman before moving to Chicago in 1966 where he studied under Renold O. Schilke, trumpet maker in Chicago. While in Chicago, he also began jazz studies with Bunky Green and started performing professionally with the swing bands of Buddy Morrow, Bob Crosby, Vaughn Monroe, Jan Garber, Ted Weems, and Bobby Christian’s Big Band. Musicians he has performed and recorded with include: Rufus Reid, Mel Torme, Carl ‘Doc’ Severinson, and Ella Fitzgerald. A co-founder of the San Antonio Jazz Orchestra, he currently performs with his Jazz Quartet, the San Antonio Brass, and as a guest performer with the San Antonio Symphony. Rankin earned his Bachelor of Music degree in composition and his Master of Music degree in trumpet performance at Southern Illinois University, Carbondale, Ill. He continued his jazz studies from 1976-78 with jazz trumpeter Marcus Belgrave in Detroit. After relocating to San Antonio, Rankin continued his trumpet studies with Raymond Crisara and finished the Doctor of Musical Arts in trumpet performance at The University of Texas at Austin in 2004. In San Antonio, Rankin has arranged, composed and performed for dozens of commercial recordings and sound tracks for companies including; Taco Cabana, Frost Bank, United Way, Enron, and the San Antonio Spurs. He was recognized with a Silver Addy Award for his sound tracks for the Fiesta Centennial Celebration. 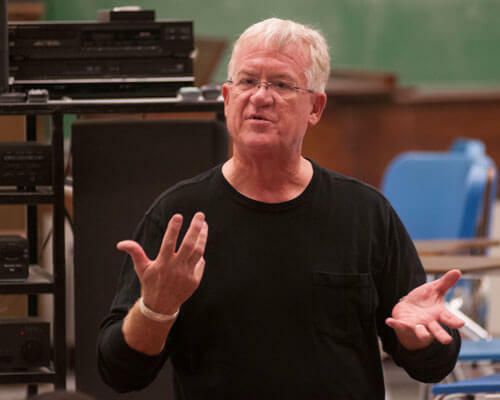 An International Association of Jazz Educators-Texas Past- President, and TMEA All- State Jazz Ensemble organizer, Rankin continued on the IAJE Board as Texas Unit Treasurer until 2003. Dr. Rankin continues to be involved as an active clinician and adjudicator at Festivals and schools throughout South Texas. A member of The International Federation of Musicians, Texas Music Educators Association and The International Trumpet Guild, Rankin also has served on the board of directors of the San Antonio Brass and as a commissioner with the Fiesta San Antonio Commission.